Hispanic students make up about one-quarter of all K-12 students — but under 10 percent of all teachers. That demographic disparity, by far the largest gap of any ethnic group, is perhaps the most intriguing nugget from an interactive data feature released by the Urban Institute last week. The tool allows users to compare the proportions of non-white teachers and students around the country. In only one state, West Virginia, is the percentage of Hispanic teachers equal to its percentage of Hispanic students. Building on research indicating that minority students attain higher test scores and drop out of school at lower rates when they have been exposed to at least one instructor of their own ethnicity, the researchers note the underrepresentation of every minority group in the nation’s teaching ranks compared with those groups’ shares of the student population. But no mismatch is greater than the one affecting Hispanic students, who are about three times as likely to be Hispanic as their teachers. In fact, Hispanic college graduates already become teachers at nearly the same rate as their white peers (9.4 percent versus 10.8 percent), narrowly exceeding the rate for black graduates (8.6 percent) and vaulting over the mark set by Asians (3.3 percent). And their growth in the profession in recent decades has been enormous: According to a Department of Education study released this spring, America’s total Hispanic teachers rose from nearly 78,000 in the 1987–88 school year to almost 288,000 in 2011–12 — a 270 percent growth rate. But even this rapid increase hasn’t been able to counteract the influence of two prevailing phenomena. First, America’s Hispanic population is disproportionately young. In 2014, 60 percent were under the age of 33. Meanwhile, the National Center for Education Statistics indicates that the average teacher is a full 10 years older than that. The swell of young Hispanic students now passing through our schools will need years to age into teaching roles. But a more pernicious trend is also at work. Although Hispanics with college degrees have shown themselves more than willing to enter the teaching pipeline, the proportion of Hispanics with that vital credential is much lower than any other ethnic group. Just 16 percent of Hispanics ages 25–34 have graduated from college, compared with 21 percent of blacks, 40 percent of whites, and 65 percent of Asians. High school diplomas are also apportioned unevenly: While white and Asian adults are almost certain to have graduated from high school in this time of dizzying completion rates (94 percent and 95 percent, respectively), and blacks are catching up quickly (89 percent), Hispanics have notably lagged behind (76 percent). 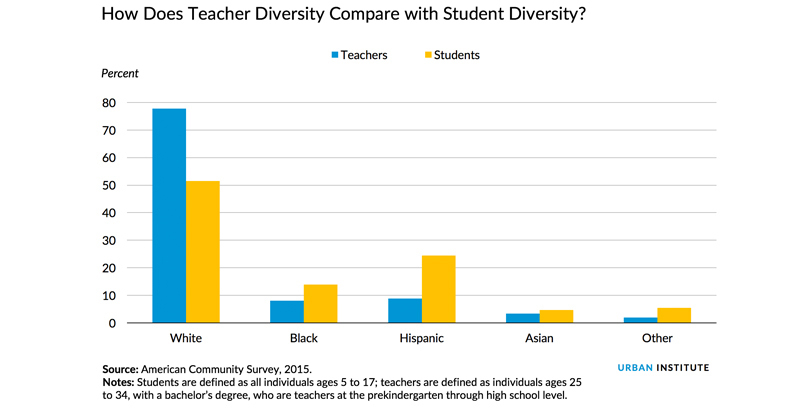 In light of such disparities, young Hispanics would need to flock to the teaching profession in vastly disproportionate numbers to balance the ratios and keep pace with young whites, who are exponentially more likely to hold the credentials necessary for winning a job in the classroom. There is good news, however: The high school dropout rate for Hispanics has been in steady decline over the past 20 years, sinking to just 10 percent last year from 34 percent in 1996. Of those students who persist in their studies, Hispanics used to have the lowest rate of college enrollment (35 percent); it is now the second-highest (47 percent), tied with the percentage of white graduates and a bit higher than blacks (43 percent). In order for America’s teaching demographics to more closely resemble its student population, the Urban Institute authors conclude, that progress must gain speed.